Rafael and Australia's Varley sign agreement for joint production lines to supply Spike missiles and other systems to Australian Army. Australian Defense Minister Marise Payne and Defense Industry Minister Christopher Pyne announced today that Rafael Israel has been selected by the Australian Defense Department to provide 5th generation electro-optic Spike LR2 anti-tank missiles to Australia's ground forces. 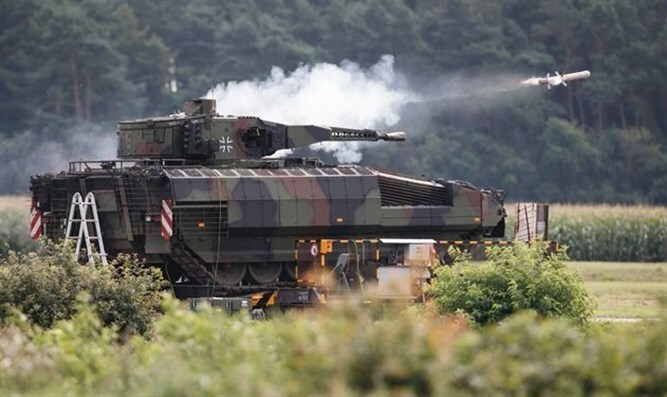 The Spike LR2 missile will be incorporated into a dedicated launcher on Rheinmetall's Boxer vehicles, which have been selected to serve the Australian Army as part of a preliminary tender. Spike missiles intended for Australia will be manufactured by Varley-Rafael (VRA). Australia is the second foreign country to purchase Rafael's new missile, in addition to the IDF. 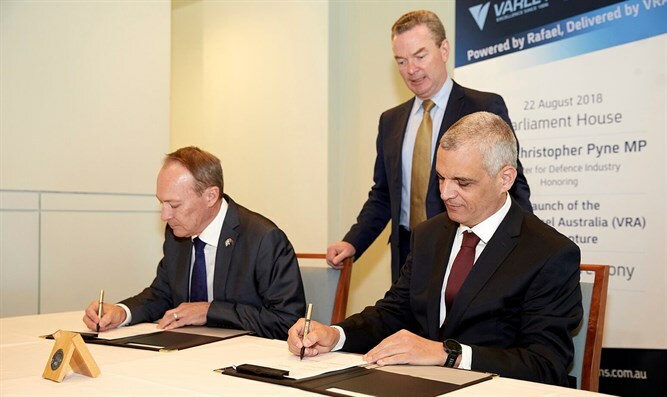 The announcement was made at the launch event of VRA, a new business-industrial cooperation between Rafael and Australia's Varley, which was held this morning at the Australian Parliament in Canberra. Present were Rafael CEO Yoav Har-Even, Israel's Ambassador to Australia Mr. Mark Sofer, and other representatives of the Australian Government and the defense industries. 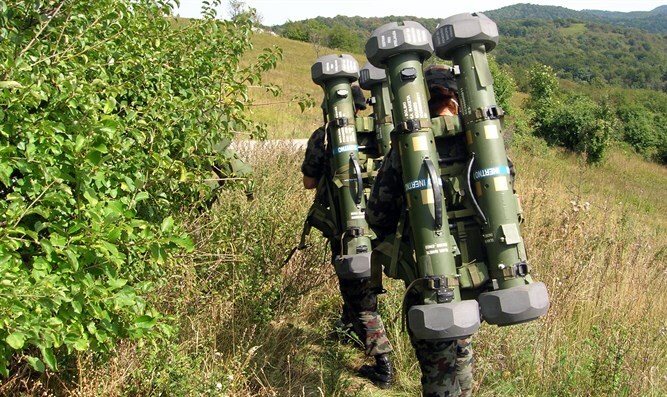 The Australian Defense Minister said: "The Spike missiles are the best anti-tank missiles for the Boxer. They'll give Boxer the ranges and fatalities needed to fight and win on the battlefield." Rafael CEO Yoav Har-Even said, "Australia's choice of Rafael's advanced Spike missiles is a significant step for Rafael in the Australian defense market. The new missile provides a response to the challenges of the modern battlefield and its development is the result of Rafael's extensive experience in the field of rocket launchers, the company's advanced engineering capabilities, and Rafael's cooperation with the IDF and with foreign armies that use these systems." Rafael's Spike missiles are advanced precision electro-optic missiles. The Spike LR2 can be launched up to a range of up to 5.5 km (ground launch), extending the range by about 35% from this missile's previous version, and up to 10 km while shooting from a combat helicopter using a wireless communication channel. Like other weapons in this missile family, the Spike LR2 is a multi-mission rocket capable of hitting a wide range of targets. The missile weighs only 12.7 kg and is suitable for firing from the current Spike launchers on land, in air, and by sea. The Spike missiles, which are widely used by the IDF and many armies around the world are precision guided missiles that can be launched from a variety of helicopter, ground, air, and naval platforms for ranges of up to 30 kilometers. To date, Rafael has sold more than 30,000 Spike missiles to 30 countries. Rafael recently won a contract to manufacture and supply 1,000 Gil-2 missiles to the IDF. VRA's launch is another expression of Rafael's international strategy to create collaborations around the world and to consolidate its capabilities in global markets. VRA will employ about 70 local employees, with the potential of hundreds of additional workers joining the supply chain of systems that Rafael offers to Australia, including a Windbreaker system, Iron Dome interceptors, torpedo missile defense, and more.